This is a collection of the best dating WordPress themes for building an online dating website or a match-making and dating community website with WordPress. The premium themes below utilize the power of the free WordPress content management system together with BuddyPress – a powerful suite of social networking plugins for WordPress. Combining WordPress, BuddyPress, one these premium themes and possibility some other premium plugins you can cheaply and easily build a powerful, robust, flexible and feature rich dating community website for people who are looking for love, friendship or ‘other’ types of relationships. People are always looking for love, so online dating is big business and the potential profits from a dating website can be massive. If you want to build a niche dating website for a niche community or certain group of folks who are looking for love these premium themes provide a cheap and easy way to get started quickly. This premium Dating WordPress Theme from PremiumPress allows you to build your own online dating agency or dating community website. The theme is built on a responsive framework making it mobile friendly ensuring it works on all mobile and tablet devices. Some of the key features and benefits of the theme include: member profile pages, online status indicator, built in chat room, chat room invitations, member gifts / winks, listing enhancements, options to charge for listings / features / membership packages, custom fields and advanced search, options to upload media (pictures, video, music, docs, PDF etc), distance calculator, drag and drop homepage layout, email marketing, banner advertising options, color and design options and much more. This theme also comes with access to a collection of 10+ child themes so you can pick and choice from a wide range of different designs. Sweet Date is a clean, modern and mobile responsive WordPress theme designed for dating and community websites. The premium theme combines the power of WordPress, BuddyPress, bbPress and WooCommerce for a fully featured, mobile friendly and customizable dating or community website solution. The niche application type WordPress theme uses a customizable Membership Plugin so you can create membership subscriptions for your site. You can create various membership levels, restrict content access / options by levels, and accepts payments via Stripe, Authorize.net, or PayPal for recurring payments. It also has optional Facebook login / registration integration. Sweet Date uses BuddyPress for the social network functionality. It has a super customisation profile area and notifications for new messages and friendship requests. 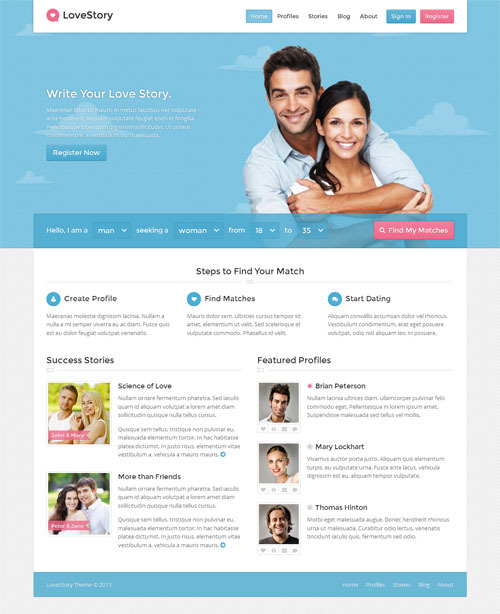 It has quick profile navigation, instant Ajax search, and a unique matching system perfect for dating sites. bbPress support is also integrated for discussion forum functionality. Some of the other key features of the theme include: a custom homepage and page builder, WooCommerce support, powerful admin options panel that lets you customize everything the way you want it, unlimited colour combinations, boxed or wide layouts, HTML5 and CSS3 code, WPML plugin ready for internationalization, over 40 custom inner pages, and much more. Love Story is a niche dating WordPress theme that allows you to build an attractive and mobile ready dating, singles or community website. The premium theme has lots of great built-in features so people can easily connect to find love, friendship or whatever else they might be looking for. The LoveStory theme allows people to sign up (Facebook login option) and create user profiles on the site. It extends the default WordPress profiles so people can create profiles, upload photos, set privacy settings, read messages, view gifts and more all without even seeing the WordPress backend. Built in profile search functionality and widget lets people find other people by their desired criteria. The theme has a built in chat system with live notifications. Users are able to start a real time chat session with each other and also receive message from other users. It also has a built in membership system that lets you create different membership levels and charge money to join. Membership payments are processed with the WooCommerce ecommerce plugin. Love Story has a powerful options panel to easily set-up and control the site. You can fully change fonts, backgrounds, primary and secondary colours, registration and membership settings, edit email notifications, create sidebars and more. The website is also mobile ready with a responsive layout that adapts to work nicely for mobile phones and all other mobile devices. Razor is a clean and professional looking WordPress design that is BuddyPress and bbPress ready making it possible for use as a dating website as well as social networks and community sites. The premium theme includes some powerful features and advanced controls for unlimited possibilities. Some of the key features include: a drag and drop layout manager to create your own custom page layouts, retina ready and responsive design, unlimited control of the homepage layout, unlimited colour choices, sidebar generator, full localization, custom headers, footers and layouts for any page, unbranded admin panel and more. KLEO is a flexible and fully customizable WordPress, BuddyPress and bbPress theme that lets you easily create a stunning dating, community or membership site. The theme is fully styled and ready for BuddyPress and bbPress and is compatible with Paid Memberships Pro, WooCommerce and other third party plugins. KLEO includes a lot of other powerful features including: a front end drag and drop layout builder, powerful admin options panel (add unlimited sidebars, change colors, fonts, layout types, masonry and standard views etc), Facebook Login integration option, live BuddyPress notifications, a fancy customizable search module, 700+ icon fonts and Google fonts, front end login, register and profile pages, make parts visible for members only, boxed or wide layouts, HTML5 and CSS3 code, and more. Do any of those themes come with the option to add a gift shift for monetization purposes? You stated for the Kleo theme, “it lets you easily create a stunning dating, community or membership site.” It did not have the function for “dating” and search options typical in a dating website. Was it updated to include these features? Features that allow a member to search with filters such as age, height, location male for female or male for male etc. I noticed in the forum in a much older post how there needed to new code added to gain these options..Thanks.